call for performers: If you'd like to perform at the tribute, please contact us at estribute@hotmail.com for details. we encourage people to sign up before hand (deadline Feb 25) so we can guarantee you stage time and try to accommodate your technical requirements. open mic: There will be a limited number of open mic spots depending on time, so come early and sign up before the show! or 212-868-4444. here is randy with more info about 'a weekend with jem cohen: i thought you might be interested in a series of screenings of jem cohen's films in nyc. the shorts program will include jem's portrait of elliott smith "lucky three." it's an incredible film. the tank (www.thetanknyc.com) is a new performing and visual arts space on 42nd street. jem will screen a number of his films march 11-13.
thanks to eric and for taking the time to send this info about the upcoming tribute show in columbus, ohio on february 21st. the show starts at 9. thanks again to everyone involved! click here to see the flyer too! here is eric with more info too. : ...with all the other tributes going on i wanted to let you know about this one that i'm going to be playing at. all the proceeds are going to the now free arts/memorial fund and i've recorded a whole album/cdr of covers to sell for $3 from which all proceeds will also go to the fund. here's the flyer. the show is at workbook studio: www.workbookstudio.com. hi, everyone. i'm jke from glorious noise. our online music magazine is turning three years old in february and we're throwing ourselves a party to celebrate. instead of blowing the proceeds on cheap booze and bad records, we've decided to donate our profits to the elliott smith memorial fund (with the official approval of Ashley and her family). this should be a really fun show, but ifeel it's necessary to tell you all that this is not an elliott smith tribute show. 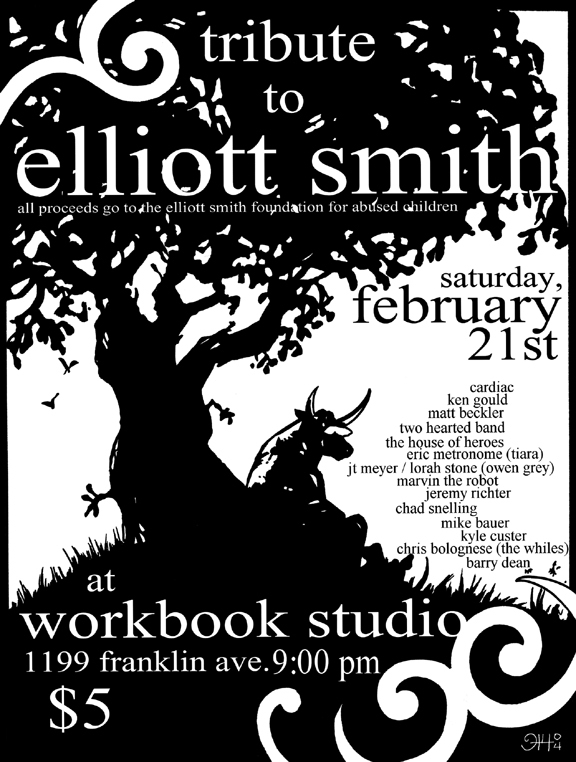 none of the bands will be covering elliott smith songs, or anything like that. still, ithink fans of elliott smith will enjoy the three bands: the millions (sort of like the darkness or cheap trick, no kidding! ), riviera (lots of pretty guitar, nice harmonies, sort of like wilco or califone), and quasar wut-wut (indescribably original, but if I had to compare them to anybody it would have to be a weird combination of the decemberists, the pixies and john lennon). plus, we'll be giving stuff away (stickers, buttons, some promo cds, posters, etc.). It should be a really good time. friday, february 20, 9pm -beat kitchen - 2100 W. Belmont Ave -Chicago - 21+ - $8 - more info. hope to see some of you there! find me, and introduce yourself. finally, i plan to take all your letters you sent to elliott's family via sweet adeline to the post office tomorrow. i'm so sorry i wasn't able to thank all of you personally for sending thousands of condolences and thoughts to them but thank you for doing that for them and elliott. for many of us elliott was the embodiment of pure love, and he gave of himself so generously to this world. february 14th, valentine's day, seems a perfect day to have a group prayer/meditation for elliott. at 7:00 pm pacific time, i'd like to encourage everyone to simultaneously, for one minute, send our prayers and loving energy to elliott for healing, light, and expansion. you all are such beautiful, devoted fans and this is an opportunity to participate in a collective moment that can be healing for us that are suffering the loss of elliott as well as giving and helpful to the perpetuation and perfection of elliott's loving spirit. please feel free to participate in any way that feels comfortable and appropriate to you. thank you and love to all. thanks to lindsay, jennifer, sierra, domenique, christine and russell for sending links to a petition to donate a part of echo park in los angeles to elliott. if you go here, you can sign your name in support of it! thanks to everyone who organized it and are signing it as well.